BALTIMORE — Maryland Gov. Larry Hogan hasn't decided to run against President Trump. But he's already challenging him on climate. The center-right Republican governor has been scheduling trips to Iowa and New Hampshire. After his landslide 2018 re-election — in a blue state, in a blue year — he used his inauguration to bash Washington as a place where "insults substitute for debate." He returned to that theme yesterday. Headlining the Climate Leadership Conference, Hogan attacked Trump's climate policy without mentioning the president's name. That's part of Hogan's strategy of distancing himself from Trump without alienating his supporters, and it's why the governor remains more popular than the president's other potential primary challengers, said Mileah Kromer, a political science professor who directs polling for Maryland's Goucher College. Instead of bashing the Paris climate agreement, Hogan bragged about the ways his state is exceeding it. Rather than rolling back tailpipe standards, Hogan talked about making 2019 "the year of clean transportation." And while the Trump administration dithers on an international agreement to curtail hydrofluorocarbons, a potent greenhouse gas, Hogan said he wants Maryland to ban the superpollutant on its own. 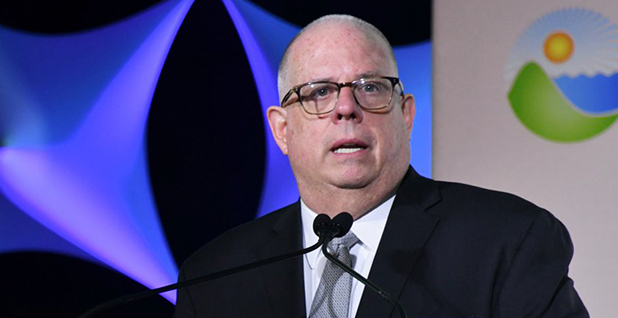 "For four years now, Maryland's been leading the charge when it comes to real, bipartisan, commonsense solutions to promote clean energy investment and green jobs," Hogan said. "While Washington, in my opinion, has continued to fail on these issues, Maryland has continued to lead," he said. Hogan touted the state's initiatives to fulfill the Paris climate agreement, reduce emissions 40 percent by 2030 and adapt the state to sea-level rise. "These clean air standards that we enacted are stronger than 48 other states and nearly twice as strong as the Paris accord recommendations," he said. With less than three weeks left in Maryland's annual legislative session, the Republican governor highlighted the policies he's pursuing with Democratic supermajorities in the Statehouse, including more tax credits and charging stations for electric and zero-emission vehicles. Hogan also gestured to his impact beyond Maryland through the Regional Greenhouse Gas Initiative, a nine-state program to cut carbon at power plants. Hogan's environment secretary, Ben Grumbles, currently leads RGGI's board. The organization's member states are working to tackle transportation emissions, and they're in the process of bringing in New Jersey and Virginia. "When we're able to complete that, RGGI states will collectively represent the fourth-largest economy in the world. And we will send a loud, strong and clear message about the power of environmental investments," Hogan said. Greens do have some problems with Hogan. He vetoed a renewable portfolio standard, forcing the Legislature to override him (Climatewire, Nov. 2, 2018). And one of his first acts as governor was to halt some poultry farm standards designed to safeguard water quality. But overall, Hogan has a 69 percent approval rating because he's so responsive to Maryland's Democratic tilt, especially on the environment, Kromer said. Hogan has been coy about his presidential aspirations, telling The Washington Post that he won't decide on a run until the autumn — after special counsel Robert Mueller finishes his investigation into Trump's 2016 campaign. Political observers say Hogan would have no chance against Trump in this political environment and might not even beat him in Maryland. But everything could change if Mueller drops a bombshell. The Republican Party has already moved to head off a presidential primary. Hogan criticized the Republican National Committee's resolution to give Trump the party's "undivided support." "What are they afraid of?" he said to Politico. Presidents do have reason to fear a primary challenge, even though no incumbent has faced a close call since 1992. Primary challenges in modern history have signaled discontent within and beyond the party, foreshadowing general-election problems for incumbent presidents. Presidents George H.W. Bush, Ford and Carter fell in their general elections after fighting off more ideologically pure challengers. And President Johnson ended his re-election campaign after nearly losing the New Hampshire primary, before Republicans flipped the White House later that year. That's what makes the Hogan-Trump dynamic different, experts said. Trump's base is more solid than President Obama's was in 2012; it's moderates who have their knives out. "At least on the Republican side, there are a lot of folks who would say they don't really care for Trump's personal style, but his ... results are pretty good. So that makes it really, really tough for anybody to challenge him on that basis," said Timothy Hagle, a political science professor at the University of Iowa. There are conservatives who still don't trust Trump, he said, but they're not going to defect over an issue like climate change. "Being more moderate isn't necessarily the way to go after Trump," Hagle said. Many observers expect Hogan to continue speaking out — but probably with his eyes on 2024 instead. "He'd only run if something shakes the base," Kromer said. Trump's other Republican rivals have also been burnishing their climate credentials. John Kasich, the former Ohio governor, recently came out in support of a carbon tax (Climatewire, Feb. 27). That rhetoric could pay off in 2024 if Trump loses re-election. But it's not a winning strategy right now. "Republicans will start to [talk climate] when they start to lose," said Andrew Smith, director of the University of New Hampshire Survey Center. Hogan is scheduled on April 23 to attend New Hampshire's Politics & Eggs breakfast, a rite of passage for White House hopefuls. For all the talk of a Trump primary, rivals like Kasich and Bill Weld, the former Massachusetts governor, haven't excited New Hampshire voters — at least, they haven't excited the right ones. "When Bill Weld came, more Democrats were there than Republicans. When John Kasich was here, more Democrats were here than Republicans," Smith said. "So the thing I'd pay attention to is, should Hogan come up, who's in the audience?"